Swimming against the tide of ‘likes’, ‘+1s’ and social ‘splash’. I’m wondering when the perceived tipping point in the corporate value of ‘social business’ is going to move from a sea of ‘likes’ and ‘+1s’ to quality employee engagement and self-development. Amidst growing demands to ‘work social’, until older ways of working are set aside to allow the necessary space to invest in ‘quality’ contributions, increased ‘volume’ is an erroneous measure of engagement. Two things are fixed, the number of hours in a day, and the increasing demands to ‘work social’. Whilst we still work ‘old school’, there isn’t sufficient time to do little more than ‘like’ and ‘+1’. As more and more employees ‘engage’ in this way, the volume of this lower ROI contribution will increase and, like a corporate popularity contest, the most frequently visited content is deemed to be have the greatest value by dint of it being the most popular. True, it is a measure of engagement – volume, it’s not the return that organisations really seek, or which reflects employees developing the skills they were likely hired for – quality and value. It may be that this is an adoption curve, that as employees dip their toes into the corporate social sea, they start out with the +1’s and the ‘likes’, get a bit more confident with the ‘that was great’ and ‘I’m not so sure’ comments, then start to wade out with questions, seeking more detail, and finally take the plunge and develop opinions, offer work for critique and truly engage with colleagues on a similar level. No one can swim for you, and until you take the plunge yourself, you’ll never move any faster than you can wade, pushing against the weight of older ways of working – that’s if you’ve ventured off of the shore at all. 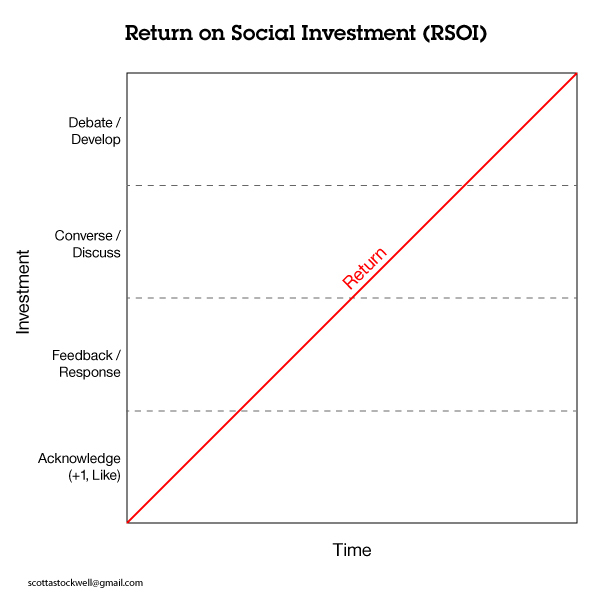 I’ve tried to illustrate this in this ‘Return on Social Investment’ graphic. Mapping social engagement, time and return. The time needed for the quick ‘likes’ and ‘+1s’ is minimal, the engagement is low, and so is the return for the employee and the organisation. This moves up through feedback and opinion into conversation and dialogue and ultimately into more significant areas contribution – which takes significant time. Until older ways of working can be set aside to allow for content with value to be created or informed responses to be framed, the demands for ‘more social engagement’ will only be met by an increased volume of low quality contributions, and not the content and engagement that truly adds value. encourage the adoption of ‘social working’ and look forward to more quality time and return on work ‘social’ investment when the majority set down older tool sets that will allow for it. I was prompted to write this article by Luis Suarez’s blog post ‘There Can Be No Resilience Without Transformation’, where Luis raises a number of issues, amongst them that “knowledge workers are no longer allowed to Play, Learn, Work” as “they (managers) come to you telling you you need to be social they all make it look like it is, yet again, another spreadsheet to fill-in, put the checkmarks in place and move on”.